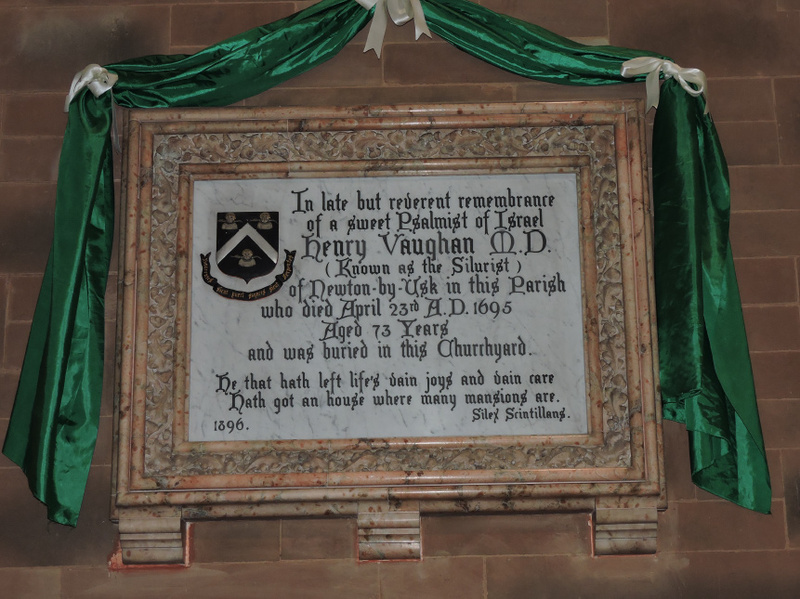 The famous poet Henry Vaughan, “The Silurist”, (1621-1695) died at Scethrog House, Llansantffraed, near Brecon and was buried in the churchyard of St Ffraed’s. 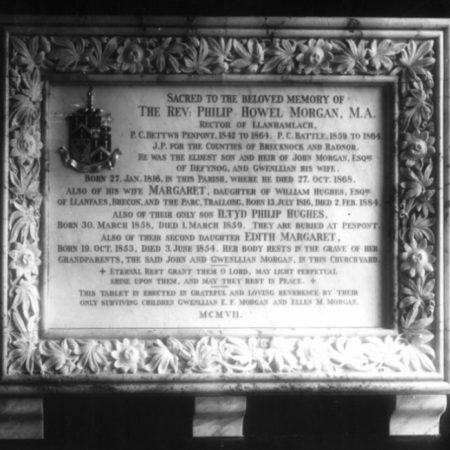 In 1897 a memorial fund raised sufficient money to have his grave repaired. At this time an ash pit had to be removed and filled in. 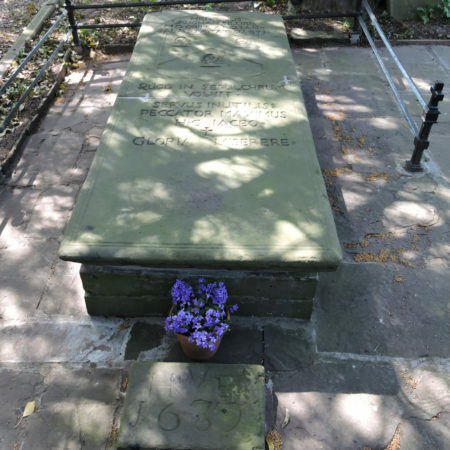 It was hoped to have the grave surrounded by railings, which were costed at £7, but there were insufficient funds for this and an appeal was made for more money to be sent to the secretary of the fund Mrs Philip Morgan of Buckingham Place, Brecon. (Mrs Philip Morgan died in 1884 so presumably this is either a mistake or the name was kept but her children had taken over fundraising). 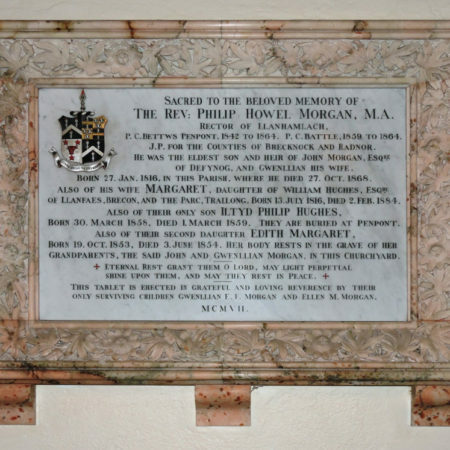 It is one of only two known examples of the use of Penarth alabaster in wall monuments of the 19th century, though several 20th century examples of memorial tablets framed in Penarth alabaster are known. Whilst there are extant records of works undertaken by William Clarke, they contain no entry for this item, so it is possible that its construction was an act of charity on his part. 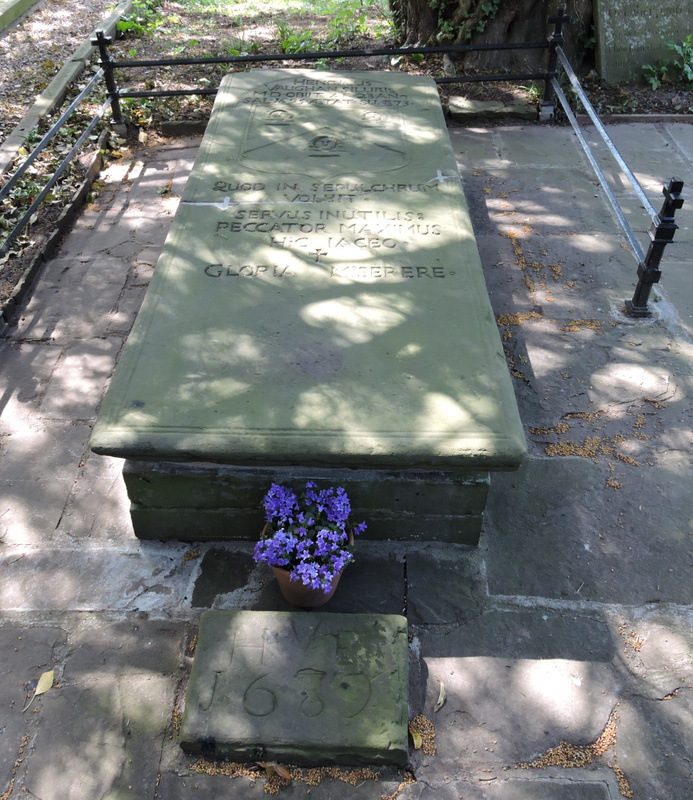 Needless to say, the yew tree mentioned in Sassoon’s poem still stands adjacent to the grave, you can just see the base of the trunk in the photograph below. 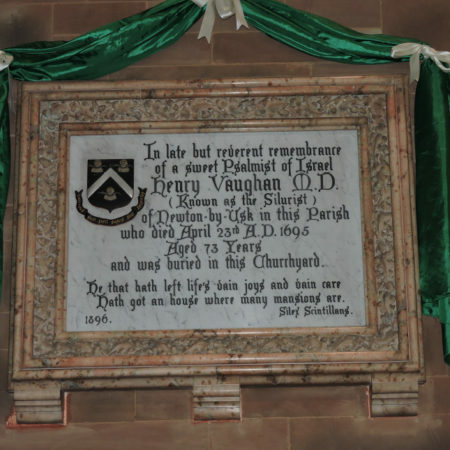 An evensong service to mark the re-opening of St Ffraed’s church and the improvements to Henry Vaughan’s grave was held on Sunday 14th September 2015. 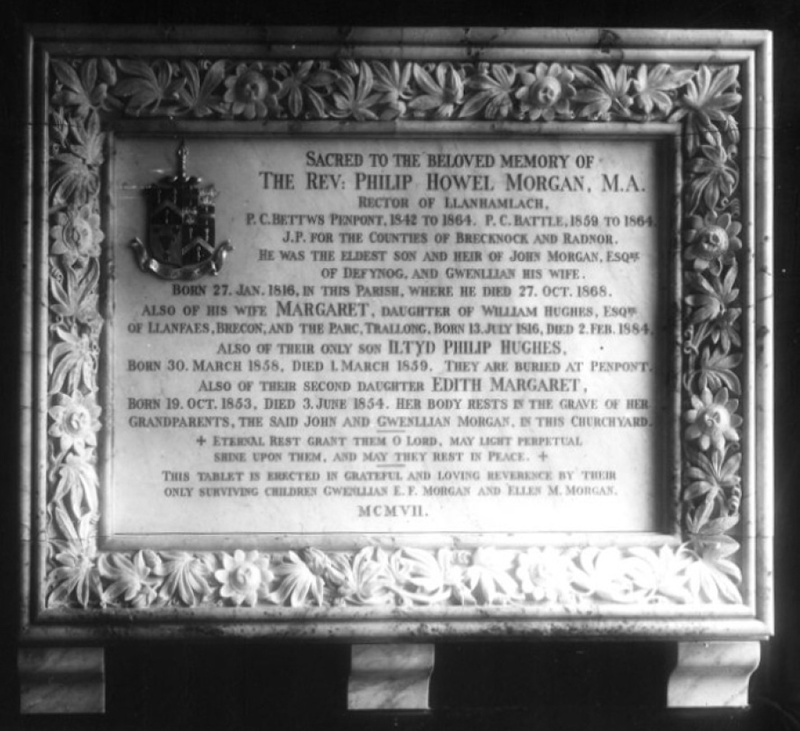 William Clarke’s work must have impressed the Morgan family because in 1907 Miss Gwenllian Morgan of Buckingham Place, Brecon and her sister Ellen commissioned him to make a similar memorial tablet to their father the Rev. 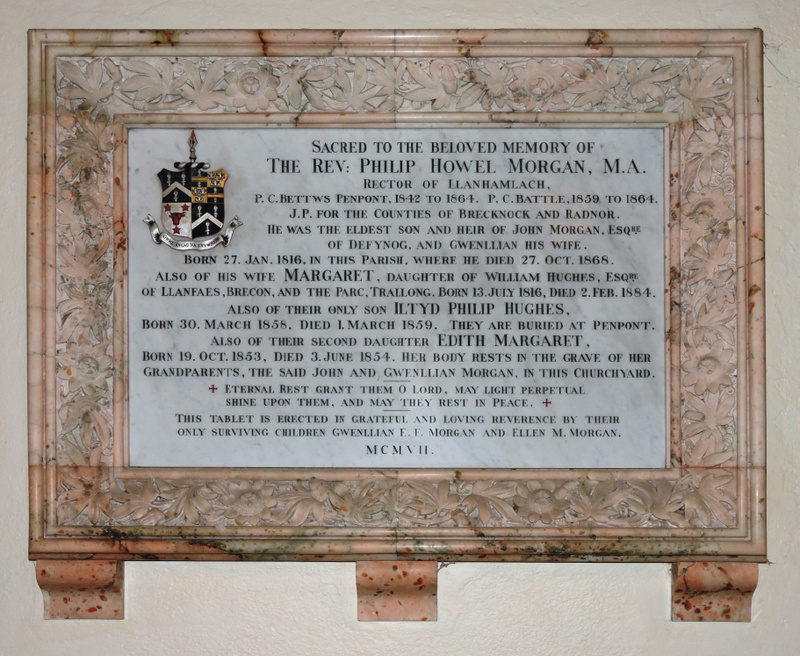 Philip Howell Morgan, his wife Margaret, their only son Iltyd and second daughter Edith, which was placed in St Cadoc’s church Defynnog; see below. The records of the construction of this tablet have survived in Clarke’s archives and although a thorough search has failed to find a design drawing, a black and white photograph of the completed item taken in the workshop was found and is shown below. The project started with a design stage in early September 1907 and presumably a drawing was sent to the client for agreement before work could start. Though the record makes no mention of this it would have been standard procedure. Work commenced in late October and the finished item was fixed in Defynnog church in the middle of March 1908. 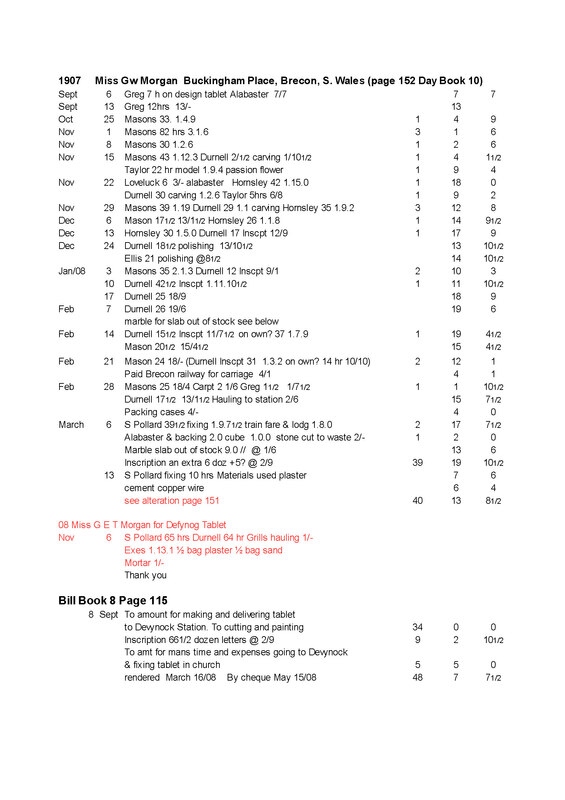 It took 873.5 man hours to complete the job at a total cost of £40.13s.8½d. The designer (Greg) was paid 13d per hour and Taylor, who produced a model of passion flowers for the carvers to follow was paid 16d per hour. The majority of the work was undertaken at 9d per hour by unspecified masons (or possibly a man called Mason?) and Durnell,who was evidently a skilled carver and responsible for the letters. It would appear that Durnell was aided or overseen by the slightly more senior Horsley, who was paid 10d per hour. Between March 6th and 13th S. Pollard, who was also paid 9d per hour, spent a total of 49½ hours travelling to and from Dyfynnog and installing the tablet. His train fare and board and lodgings for this period came to £1.8s. The client was billed £48.7s 7½d, which represented an overall profit of 15%. 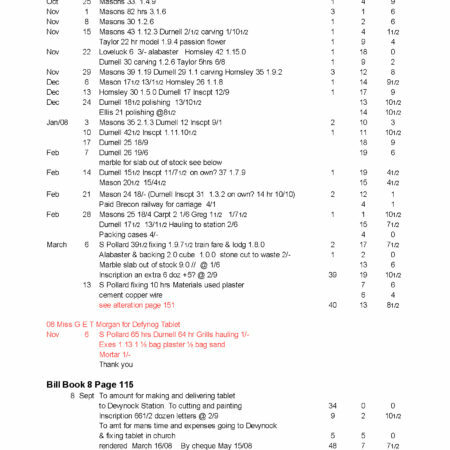 Occasional running total expenditure figures on the Day Book sheet have been left out for the sake of clarity. 1 Western Mail, 11 May 1897. Henry Vaughan “Silurist”. The Memorial Fund. 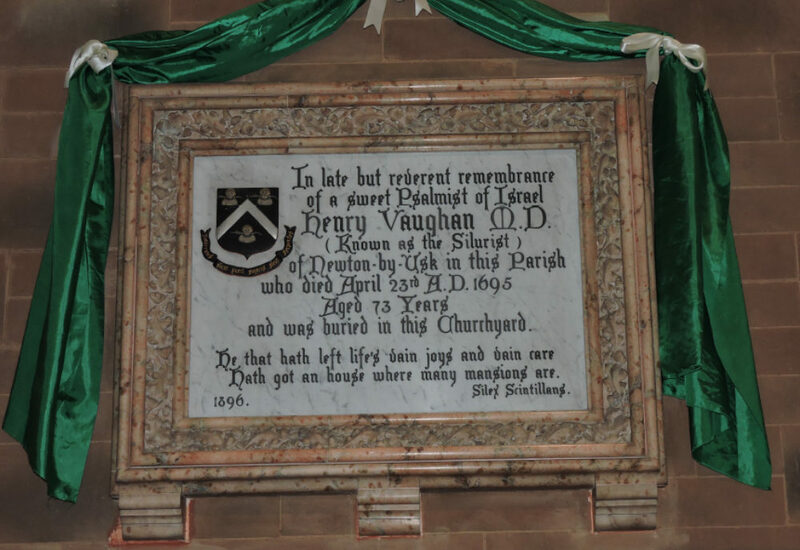 2 http://www.bbc.co.uk/news/uk-wales-mid-wales-29413400 Grave of poet Henry Vaughan has £10,000 restoration.